Rather than being a Cheap-Charlie ASEAN-built model that is designed around last-generation technology, the Nissan Note is built in Japan and is based on the Renault-Nissan Alliance’s global V-platform with Euro NCAP-worthy safety credentials such as Vehicle Dynamic Control (VDC), while keyless ignition comes as standard. 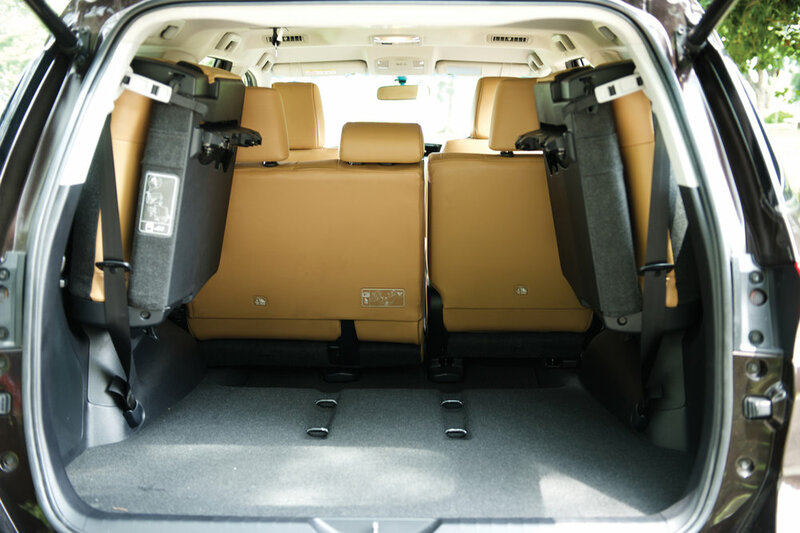 Perhaps for local customers, the biggest draw of the Note is how spacious its cabin really is. While it may look like a small car from the outside, its Doctor Who Tardis-like interior offers more rear legroom than any hatchback on sale today. Even when the driver’s seat is adjusted for a 1.8m frame like mine, the seat behind will easily offer another 10cm to spare before the rear passenger’s patella reaches the backrest in front. Locally, the Note is available in two versions of the three-cylinder 1.2-litre engine. 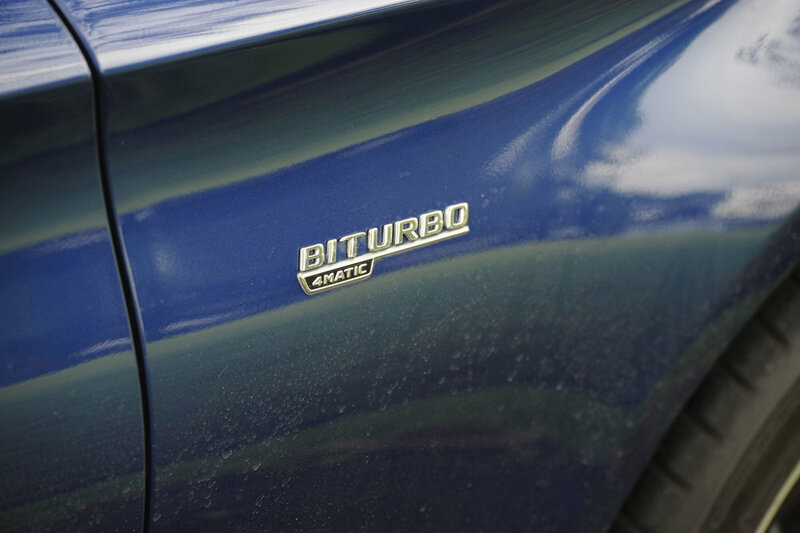 If you’ll pardon the pun, the base Note comes with a naturally-aspirated unit that makes 80hp. However, things get interesting when you step up to the DIG-S model tested here, which stands for Direct Injection Gasoline-Supercharged. In addition to an Eaton-sourced supercharger, the clever DIG system is capable of some clever valve-trickery to improve fuel efficiency by running on a Miller Cycle that delays the closure of the intake valves until the cylinder is well into its compression stroke and therefore minimises resistance. Besides a modest power hike to 98hp, the DIG-S Nissan claims lower fuel consumption and CO2 figures of 4.6-l/100km/ 106g/km CO2, compared with 5.0-l/100km /117g/km CO2 for the base model. The more powerful car’s fuel figure is frustratingly tantalising for punters as it misses out on the $15k tier of CEVS rebate by just 1g/km of CO2! As the numbers will have told you, the Nissan Note is intended more for eco than evo and to this end, it is only available with a Continuously Variable Transmission (CVT) which complements the car perfectly with a smooth ride that is unflustered by even the most ham-fisted drivers. To get the best from the Note, a smooth driving style is recommended and will be rewarded with progress that feels quicker than its on-paper 0 to 100km/h time might suggest. Selecting Eco mode via the button down by the hand brake lever sets the drivetrain in its most efficient setting as well as turning the driver’s instrument panel into light show that encourages frugal acceleration. The more ‘Eco’ your driving is, the broader the turquoise coloured display is. When the engine is shut at the journey’s end, the display flashes a score of 1, 3 or 5 to tell you how efficiently you’ve been driving – the higher the number, the more Eco you are. One unexpected but pleasant surprise about the Note is that it offers a remarkably refined and stable ride for a car of this size. On the road, the electrically-assisted power steering feels like it cuts out at around 60km/h but the driver is rewarded with a sweet, positive feel that inspires confidence at expressway speeds. With a kerb weight of just 1,070kg, the Note makes the most of the 98hp and 142Nm of torque at its disposal. For 2017, the E12 series Note has been restyled at the front end to visually align with newer generation of Nissan models such as the new Pulsar – reviewed elsewhere in this issue – along with the Qashqai and X-trail Sport Utility Vehicles. Around the back side, the Note now gets darkened LED tail lamps. 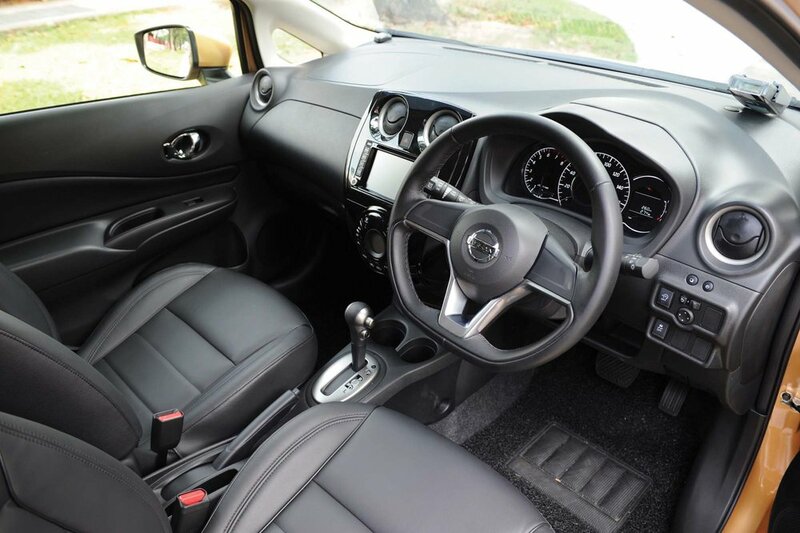 Inside, sportier-looking a flat-bottomed steering wheel and new seat cover design sums up the changes to the cabin. With a premium of just $3,000 over the naturally-aspirated Note 1.2 CVT, the DIG-S variant is clearly the one to go for. Besides the a more efficient and powerful supercharged engine, it also comes with factory fitted items such as LED headlamps, which can be set to turn themselves on automatically in the dark, digital climate control and a cool-looking electro-luminescent Combi meter. Complaints? Minor ones really. While the Combi meter found on the Note DIG-S looks good, it actually lacks a coolant temperature gauge and makes do with just a warning light that unfortunately means your engine has over-heated by the time it comes on. The inability to switch the units on the trip computer from km/l or mpg to l/100km for example is another small annoyance that is unlikely to be a deal breaker or even noticed at all by most owners. On the other hand, the good news is that there is still plenty to like about the Note such as its value for money and practicality. The changes inside the facelifted Note are limited to a new flat-bottomed steering wheel andseat cover styles. Similarly when it comes to cars, Ferrari will have unveiled its 800hp 812 Superfast at the Geneva Motor Show by the time you read this. Personally having driven its predecessor, the F12, which made 70hp less, having this much power going through just the rear wheels was only possible with electronic intervention managing the output to make it driveable. When it rains, as it did on my test drive, “Forget about it,” as a wise guy might be apt to say. The instrument display lights up like a Christmas tree and the power delivery cuts in with more abruptness than a Trump immigration policy. Granted, the 509hp output of the Mercedes-AMG C 63 S is not as excessive although the car’s suspension and gearbox is designed as if its driver was going to redline the bi-turbo V8 in every gear and drive it on the track more than the road. God bless you if you’re fortunate enough to fall in this category but this extreme setup makes it impossible to relax in when you’re in the mood for some pampering. In many ways, the Mercedes-AMG C 43 4Matic tested here has a greater breadth of talent than its more powerful brother. With two less cylinders, its 3.0-litre bi-turbo V6 ‘only’ 367hp and the power is sent to all four wheels rather than just the rear. There’s still plenty of oomph to get you in all kinds of trouble if you’re foolish, but keen drivers will appreciate being able to utilise all this power without succumbing to electronic intervention unless it is driven in extremis. 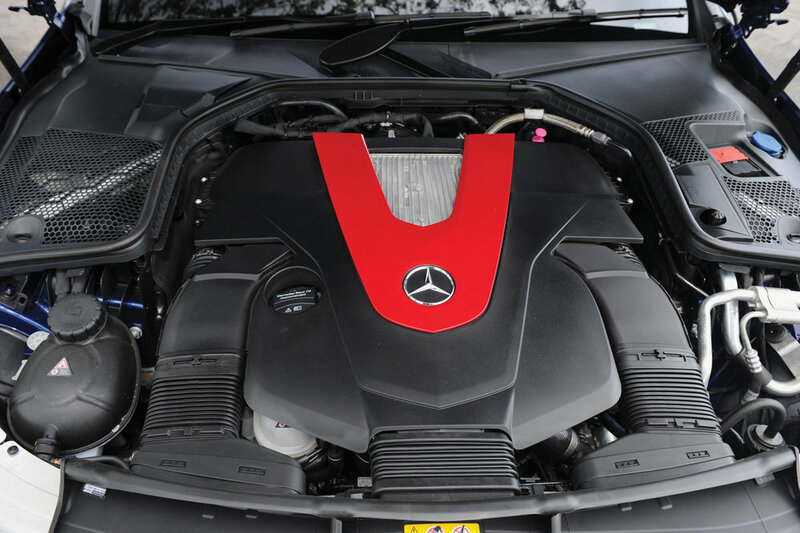 The C 43’s bi-turbo V6 might lack the crackle and pop drama of the C 63’s full-fat blown V8, but smaller engine’s turbos snap to attention just as quickly to catapult car and driver towards the horizon from just 2,000rpm with no let up until 6,000rpm, by which time you would have slammed into the 250km/h electronically limited top speed. If the C 43 and C 63 were driven together, the lesser car would have no problem being every bit as quick. The less savage power deliver of the ’43 also means that its driver won’t have to be as hard on the brakes as the guy behind the wheel of the ’63. 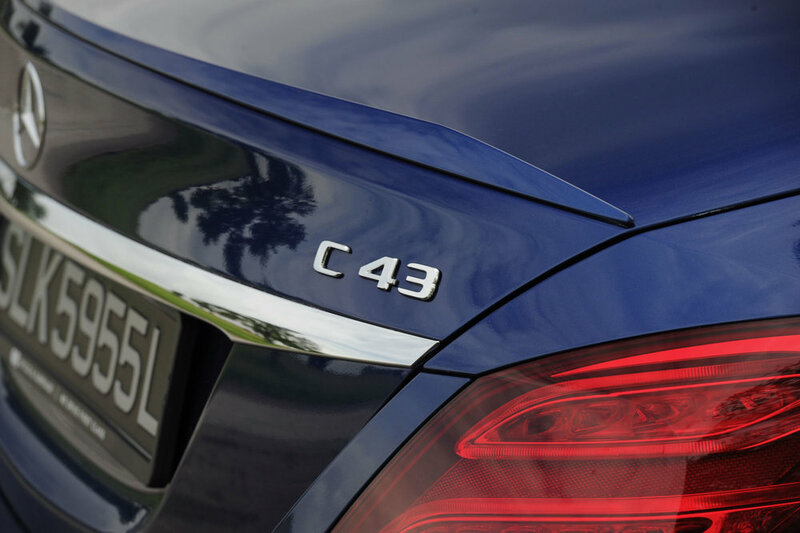 When driven within the legal limits of public roads, the C 43 imparts a level of civility that makes this car much more versatile than the C63 as an everyday drive. The ride may still be on the firm side of a family car but it won’t shake your tooth fillings loose like the C 63 S will. It’s nice to see that Mercedes still makes cars like this to carry on this tradition while those looking for something more flamboyant are also catered for. Best of all perhaps is the small matter of a $132,000 between the C 43 and C 63 S that makes the car tested here look like the smart money option. The last time I drove a Toyota Fortuner was when the first generation was launched. Then, it looked like someone had grafted an SUV tailgate to a Hilux pick-up truck on which it was based. The suspension left no doubt as to its off-roading capabilities because its was so harsh that you might as well be driving on the rough stuff anyway. If you could put up with the hard ride, the drivetrain would leave you hoarse if you attempted a conversation with your passengers at expressway speeds as the din from the engine and transmission competed with the radio to be heard. In a word, the original Fortuner was agricultural. Amazingly, that car stayed in production for 10 years. Enter the second generation Fortuner that you see tested here and the immediate impression is one that had us doing a double take. While its size and height still cuts a commanding presence, its styling now imparts a similar sense of sophistication as Toyota’s other popular people movers such as the Alphard and Vellfire. When viewed from the rear, its LED tail lamps lead the eye to its flanks and would not look out of place when parked next to the current range of Lexus Sports Utility Vehicles. At 279mm, the Fortuner offers a standard ground clearance that offers more daylight between its undercarriage and road than even a Jeep Wrangler Unlimited. Other than being useful in a flood or off-roading, this generous ride height translates to offering the Toyota’s occupants with a terrific vantage point all around. The downside however, is that climbing on board can be challenging especially for the elderly with mobility issues. Where the new Fortuner has improved most however, is in the way it drives. The cacophonous clatter that greets the driver at start-up is all but banished. The build quality and that of materials have also improved to the point where they are more than a match for its up-market cousins, Lexus. 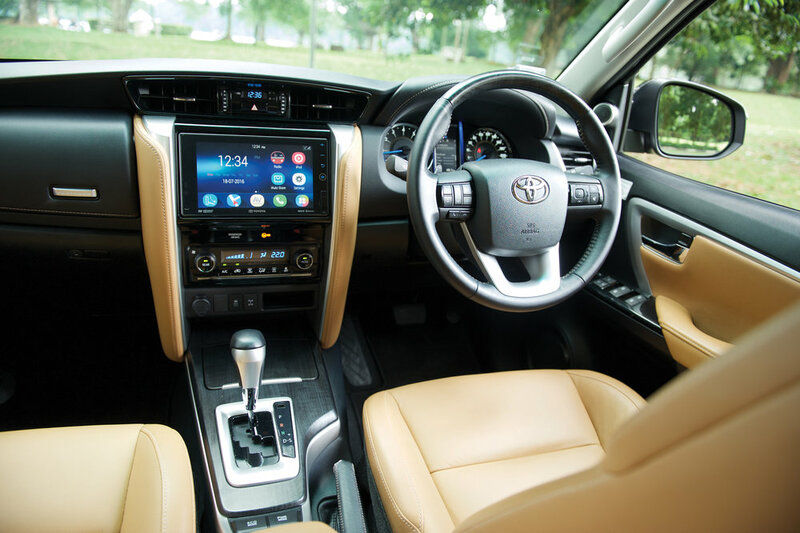 The Toyota even manages some classy accoutrements like an electrically-operated tailgate and a six-speed automatic gearbox. There’s even an eco-driving indicator to help drivers eke out the best possible fuel efficiency from this massive car. Turn the steering wheel and it responds with a reassuring level of heft that imparts a feeling of quality and stability; feels almost like a Chubb safe on wheels. The engine refinement has also improved to the point where its occupants could be forgiven for thinking that a smooth V6 presided beneath the Fortuner’s bonnet instead of a 2.7-litre four-cylinder unit. There was never any assumption however that the Fortuner was going to be a Cayenne beater in the performance department but within its own context, it does an admirable job of holding the driver’s chosen line through a turn. Save for a slight bobbing at low speeds, the driver can easily remedy this by adjusting his speed and driving style slightly to match the harmonic resonance of the suspension setup. Hyundai Santa Fe and Kia Sorento. The 8AR-FTS engine, otherwise known as the 2.0-litre turbocharged power unit, is quickly becoming ubiquitous in the Lexus model line-up. The GS 200t or GS Turbo as it is also called is the latest Lexus to be fitted with this powerplant. While the NX 200t was the first Lexus to be fitted with the 8AR-FTS unit, the GS 200t benefits from a higher power output to bring the total to 241hp instead; seven horsepower more than the SUV. Although torque outputs remain the same and peak at the identical rev points in both cars, the power delivery in later models to receive the 8AR-FTS unit such as the IS 200t and the car tested here feel more like the turbocharged models from Lexus’ German rivals, which is no bad thing. When accelerating from low to medium speeds, the engine comes into its optimal torque band and acceleration gets underway with delicious urgency. It gives the impression that this car is light on its feet and there’s plenty of power in reserve. This is true to a point, but chances are it’ll feel slightly breathless as you approach the car’s 230km/h maximum speed. a Lexus rather than something that apes a Continental make. In the NX, this was certainly true but it came off feeling a tad disappointing as it ended up feeling like there was a 2.5-litre unit under the bonnet instead of a 2.0-litre turbo. Like the IS Turbo, this GS feels rather more convincing as well. Perhaps it is simply a case of practice makes perfect as the Japanese carmaker becomes accustomed to bringing out the best from the 8AR-FTS with every successive variant released. While the IS Turbo is more accessible and renders a somewhat sportier drive, the GS offers more interior space and sophistication without giving much away in the performance department. The GS’ steering has a decidedly weightier feel to it than the IS 200t, which some folks including this writer prefer as it seems to impart a sense of quality. At the end of the day however, the car with GS the Turbo moniker is ironically the least sporty variant of the range. Those looking for something more focused need only to refer to the previous test drive. If you’re in the market for a BMW 5 Series or the recently launch all-new Mercedes-Benz E-Class, then the Lexus GS Turbo is something that you would do well to take a look at. As a follow-up to the 1M Coupe, which we loved to bits, the M2 offers more capability as an everyday car and smooths out the rough edges of its predecessor plus offers the convenience of a seven-speed automated gearbox as well. While these improvements, along with a rear axles and other bits taken from the M3 and M4 make the M2 empirically better in every way, this ironically puts the car in danger of being a little too clinical in the way it goes about its business. Faster lap times are one thing, but purists crave for more an immersive experience when it comes to road cars. What made the 1M Coupe a classic was the way it made the driver feel involved in the process, rather than just coming along for the ride. Within the first 50 metres of driving off in the 1M, its steering wheel would gently writhe in your hand like a leash on a well-trained Bloodhound and the six-manual gearshift would slot into each gear with the precision of a bolt-action rifle. The M2 in standard form with its M-DCT twin-clutch doesn’t quite do that however. Instead, it feels like a more hyper version of the already lovely M235i, which the M2 shares it engine with. While the M2 certainly isn’t lacking in the horsepower or handling department, perhaps the newly-introduced range of M Performance Parts for this car will help dial in some of the X-factor that would take it from being merely good to truly great? Fresh off a recent local launch, the M2 tested here comes with just about the complete catalogue of M Performance Parts designed for this car. Besides being fitted as aftermarket options, these official accessories from BMW do not prejudice the car’s factory warranty, fuel consumption or CO2 emissions. The range of M Performance parts range from mainly aesthetic to moderately performance enhancing and seem to invoke a more emotional, rather than measureable response. The thing to note, however, is that the M2 doesn’t need a whole lot of augmentation in the first place, as there’s nothing that’s really ‘wrong’ with it. We’re looking for small and subtle enhancements to bring out the best in this car and not to mess with the original recipe. The M Performance Parts product portfolio features a particularly extensive range of aerodynamic components made of carbon fibre. These include front and side sill attachments, rear diffuser and mirror caps that are apparently wind tunnel tested as a cohesive package to maintain the car’s aerodynamic stability at speed. In other words, if you’re adding a carbon fibre spoiler to the boot lid, you should also add the front lip and side skirts while the wing mirror caps complete the look. Inside, the M2 driven here was also fitted with a plethora of M Performance goodies such as The M Performance Pro steering wheel with grip areas covered in Alcantara. It is particularly distinctive in its shaping and generally has a harder foam body than the standard steering wheel. This results in better grip and arguably, a more precise steering feel. It also has a light blue central marking at the 12 o’clock position while the three-colour M seam and the optional open-pore carbon fibre trim element with M Performance inscription make this wheel look the business. There’s also an even more extreme steering wheel option with an integrated race display in the upper section of the rim that reads out information such as section and lap times, longitudinal and transverse acceleration. The unctions are controlled intuitively by menu buttons integrated in the thumb recesses of the steering wheel. In addition to the race display there is also a gearshift indicator: two bi-colour LED light strips on the right and left that run towards each other. 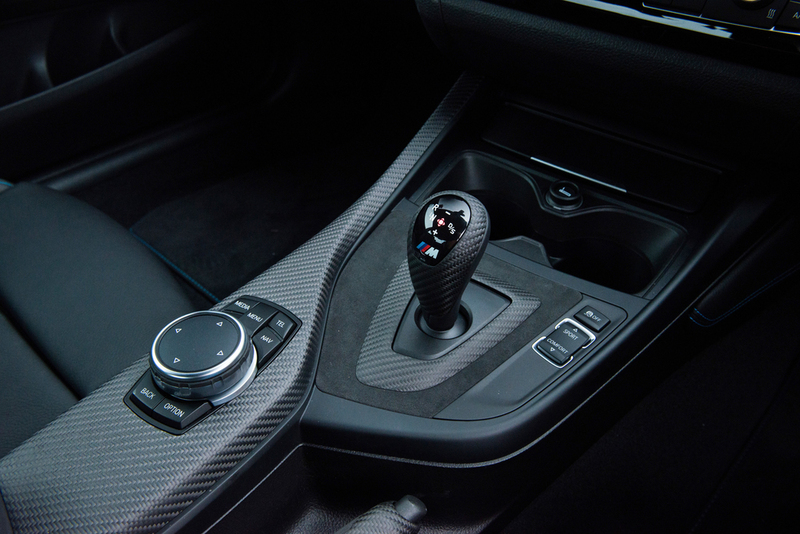 Elsewhere, the interior is rounded off with the M Performance Interior Kit Carbon, featuring trim elements for the twin-clutch transmission gear selector level, centre console, handbrake handle and the M Performance interior trim finishers with even more lashings of Alcantara and carbon fibre. Unfortunately, the Bluetooth operated exhaust system is not approved for use in Singapore. Available in other markets, this M Performance Part option features a silencer flap that can be made be operated by Bluetooth to toggle between Sport and Track modes for as BMW puts it: “a more intense perception of the engine sound”. The visual treatment of high-gloss black however, is available locally with a carbon tail pipe trim and 93mm diameter opening. While aero kits and fancy exhaust systems serve to enhance the sense of occasion, the optional BMW M Performance coil-spring suspension promises to sharpen the M2’s road holding and handling capabilities. When fitted, the BMW M Performance coil-spring suspension lowers the car by as much as 20mm. When used in tandem with the full aero kit, the M2 appears to hug the ground even more dramatically. Interestingly, in spite of the lowered height, the test never bottomed out over speed humps or bumpy roads when driven moderately. The M Performance suspension is also tuneable and offers the driver as many as 16 levels of adjustability in the rebound stage and 12 in the compression stage. Even at its softest setting, the M Performance suspension system exhibited noticeably more body control with less roll as well as pitching and squatting under heavy braking and acceleration. Another option from the M Performance catalogue that influences the M2’s drivability is the sports brake pads that are suited for track use and are more resistant to brake fade even under extreme use. If you’re planning to take your M2 for track days or are a regular on the B-roads of Malaysia, having the confidence of brake pads that won’t quit on you can be reassuring. It has taken four generations for Toyota to realise that the Prius doesn’t have to look like an oddball design concept just because it was one of the first volume production cars to mate a petrol power plant with an electric motor. Stylistically, Mk4 of the Prius no longer conjures up images of an SMRT taxi thanks to an edgy new shape that is a abject exercise in metal origami when it comes to the number of contrasting creases front, side and rear. It all gels now and judging by the number of heads being turned by the ‘Emotional Red’ (see what Toyota did there?) colour scheme of our test car. Whatever colour you might be interested in though be prepared for a long wait from main dealership, Borneo Motors – four months to be precise. Stunned? Don’t be. It was up to nine months but the dealership has worked some magic with Japanese distribution channels. Overwhelming demand for the car in its home market has caused the delays, says Borneo Motors. So, the Prius has finally grown up as a properly good looking saloon that eschews the slabby exterior of the Mk3 with its striking new trapezoidal LED lights front and rear and a revised coupe-like roofline that adds length to the stubbier visage of previous generations of the Prius. The new nose is apparently inspired by the Mirai – Toyota’s hydrogen powered fuel-cell car. It’s more than a visual effect though. The new Prius is now 6.1cm longer, 1.5cm wider and 2cm lower than the previous model. The car is now built around the new Toyota Global Architecture Programme and results in a 60 per cent stiffer chassis. It also allows for the inclusion of a double wishbone rear suspension. This, combined with the lower centre of gravity, does make the Prius an eminently satisfying proposition for hustling through left to right bends. You sit reasonably low in the car and while the Prius is honestly not an evo-mobile in any sense it does have more of a sporting side to it than you would imagine for car that is associated with Hollywood tree-huggers. The thing is, you need to give it some gas in order to do that and that’s not how a hybrid is really intended to be driven… More of that in a moment. The electric steering rack is surprisingly talkative for a family hybrid and aligns itself well with the go-faster starship styling of the car. With a revised 1.8-litre 4-cylinder petrol engine and a higher density Nickel-Metal Hydride battery powering the electric motor and coupled with an improved drag coefficient of 0.24 compared with the 0.25 of the previous generation Prius, the latest model is claimed to achieve a combined fuel consumption of 3.7L/100km; that stacks up against the claimed average of 4.7L/100km. of the previous generation. Go back to the first generation Prius of 1997, with a claimed combined fuel economy of 5.7L/100km and it is clear the progress this hybrid technology has made over the intervening years both through drive train development as well as weight savings and aerodynamic streamlining. Hi-tech accoutrements in the cabin includes settings for Normal, Eco, Power and EV (Electric Vehicle), an invaluable full-color head-up display that is projected on the windscreen, a multi-function steering wheel incorporating Bluetooth hands-free mobile phone connectivity and smart entry keyless ignition, plus a reversing camera projected on to the central infotainment screen. Being a hybrid, there’s a lot of information to soak up on this readout. It includes a schematic of the car’s chassis to show how much of the drive is being propelled by electric power and by the petrol engine, while a ‘Trip Information’ button offers a very confusing bar graph (if you hated maths at school) that shows the amount of electric power regenerated over a 15-minute period from your previous journey, your projected cruising range left based on the current driving style and your average fuel returns, both real time and from past trips. You also have the option to view your speed on an LED readout directly above the steering wheel along with which driving mode that has been selected. Working out your fuel returns and helping to squeeze the last millilitre of petrol from the car’s tank through this plethora of LED graphs and diagrams is all very laudable for those who are fanatical about getting into a Guinness World Record road book but more many of us, I suspect it will be enough to know we have a car that can take us a very long way on one tank if we are easy with the right foot. Travelling on purely EV mode will work for maybe a kilometre or so before the batteries are spent but even then you have to judge your throttle modulation so carefully up to around 50km/h that it’s not always feasible to maintain EV in stop/start town traffic. get decent enough economy, it’s not sipping petrol the way it is truly supposed to if you want to elect the full Thrill of Driving. Driven the latter way, the Prius will drink more but certainly becomes more of a fun proposition. - Do you want to drive a car like a learner to optimise fuel savings? Why estates have never really caught on remains a mystery. For starters, they offer the drivability of a sedan while being able to carry bigger loads. Even if you don’t have a compulsion for flat-packed furniture, there’s no denying that stations, estates, shooting brakes or whatever the manufacturer calls them are more stylish than their three-box contemporaries. A case in point is the car tested here. In VW-parlance, it is known as a Variant, which makes things interesting when we start referring to the Variant variant – not unlike ‘the the’ Ferrari; (La)Ferrari. In any case, the Passat Variant makes the most of the already classy styling that the VW’s latest family sedan is blessed with. Up front, it gets a cool LED daytime running light treatment paired with a slim grille that adds up to impart a menacing stare that aligns it more with the Phaeton flagship rather than the Golf family that resides beneath it in the brand’s line-up. The Passat may stem from a family car background, but VW’s designers have (rightly) styled this car to look as sophisticated as an executive Audi, BMW or Mercedes for its cars like the A4, 3 Series and C-Class respectively that have been chipping away the family car segment this VW resides in. Tasty details such as 19-inch tyres and LED head and tail lights augment the overall classy appearance that continues inside. With the 2.0-litre TSI models, a full digital screen is found in the driver’s instrument binnacle. Dubbed Active Info Display, this 12.3-inch screen renders a digital image of the speedometer and tachometer while allowing the driver to display information such as satellite maps or fuel efficiency readouts. Locally the Passat range is topped by the 2.0 TSI Variant variant tested here. 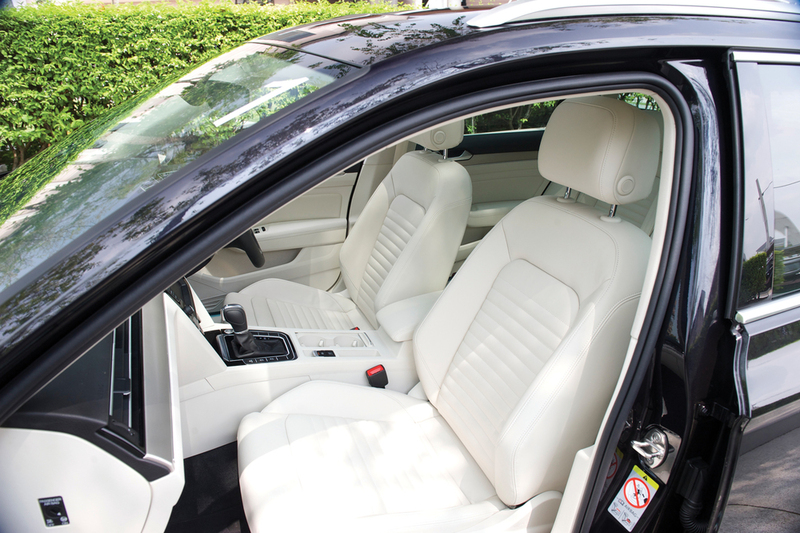 The classy though questionably practical off-white leather seats and panoramic sunroof give the cabin a welcoming ambience. Rear passenger space is also generous as three adults can be comfortably accommodated on long road trips while the Variant’s cargo bay is all too happy to swallow 650-litres of baggage or even as much as 1780-litres if you load it to the roof. I have always suspected that estates handle arguably better than their equivalent sedans on account of their rear suspensions being beefed up to accommodate the additional loads. Although I did not get a chance to put this theory to the test in a back-to-back comparison, this Passat Variant at least, performed convincingly up the steep and twisty roads to Genting Highlands where tarmac lined with slippery moss, and altitudes of up to 1000-metres above sea level would show up lesser cars. At no point did the VW run out of breath as this is one the advantages turbocharged engines offer over naturally-aspirated motors that would be sapped of horsepower by now. The six-speed DSG automated twin-clutch transmission also makes the most of the available power and torque to the point where the driver seldom if ever needs to call upon the paddle shifters for manual overrides. The ethos of the Passat Variant however is more comfort and long distance cruising ability than outright performance. For others, the car’s highlight is bound to be the Dynaudio sound system that keeps all aboard entertained with bass-thumping ability and crystal clear high notes. Just as well that this car’s infotainment system comes equipped with Apple CarPlay, MirrorLink and Android Auto, which will be automatically activated when the appropriate mobile device is plugged in. In Apple CarPlay for example, the central touchscreen effectively became an extension of my iPhone with ‘essential’ apps being available such as Phone, Messages, Apple Maps, Podcasts and Music being presented on the main screen. Apps such as YouTube or video-playing apps are locked out as the driver is not expected or shouldn’t use them while driving. To be a proper Q-car in the evo sense, the Passat Variant needs at least another 100hp or so along with a proper work-out in the Volkswagen’s R department. However, it’s hard to fault the current car when you consider its price point of $184,300 with COE. At this price point, the level of fit and finish is something you might expect to only find in the $300k segment, yet alone a level that lists in the sub $200k-range. So on that count, the Passat Variant should please all but the most demanding of drivers.